Andros has an impressive network of over 300km of footpaths. The network extends across all parts of the island and until the arrival of the motor car it was the main transport infrastructure for the 30,000 people who once lived on Andros. About 170km of hiking routes have been restored and are fully way marked and sign posted according to European standards. The varied landscape of Andros offers a treasure trove of hiking experiences. In one day it is possible to pass through lush green landscapes with gushing waterfalls, cross a rugged mountain and descend through ancient walled terraces on a hillside to a sandy beach on the shores of the Aegean. Most of the restored paths can be walked in a day. Each path has been given a route number which is regularly way marked along the path. To plan your trip we recommend purchasing our map (details here) which has all of the walking routes marked on it. Please go to our Detailed Descriptions of Hiking Routes for more information on each of our 29 different day hikes. One hundred kilometers of our paths forms a continuous walking route across the island. 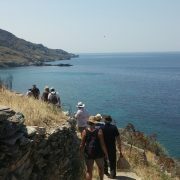 Known as the Andros Route this continuous path can be walked at a reasonable pace in 10 daily sections. Like all our restored paths the Andros Route is fully way marked and sign posted according to European standards. 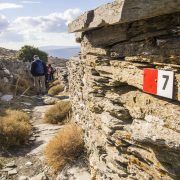 In 2015 the Andros Route received the hiking quality certification “Leading Quality Trails- Best of Europe” from the European Ramblers Association. 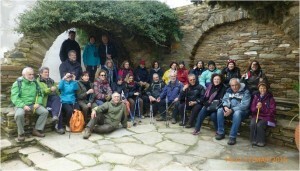 Andros is the first and so far the only island in Europe to hold this distinguished hiking certification. Make sure you’ve got plenty of food and drink and wear suitable clothing. Although snake bites are rare on Andros consider wearing boots and long trousers even in warmer weather as a precaution. Check the weather forecast before you set out. In spring temperatures can rise significantly by the afternoon so always take plenty of water and a hat. At certain times of the year Andros will experience strong winds. Some of the paths have exposed sections at high elevations so you may want to choose lower altitude routes on windy days. On the tracks, you may find improvised doors or metallic grids used as gates. Please open them and close them again behind you – they are mostly used for keeping out or herding goats. 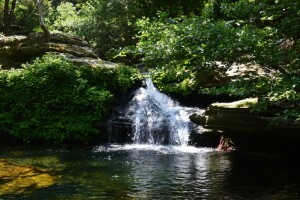 There are many springs and rivers with safe drinking water on the routes of Andros. 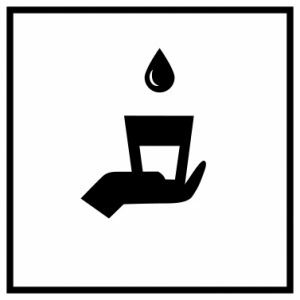 Look for the safe water pictogram. Sometimes parts of the paths coincide with ravines or small streams, so it is important to have the necessary gear and preferably waterproof hiking boots. There are several types of paths and trails on Andros, stone or cement-paved. Usually, when passing through settlements the paths are cement-paved though in rare cases they are maintained in their initial form – stone-paved. Most of Andros’ paths are walled and are called in the local language “stenes” (plural), “steni” (singular). On some routes sections are connected by dirt tracks and in some cases there are short parts along asphalt roads. Also, there are many places where dirt tracks or asphalt roads suitable for vehicles cross the routes, allowing hikers to to vary their hikes by chosing to drive to one of these intersections to start or end. Andros is a mountainous island with a sharp relief. The highest mountain, Petalon, rises to 1,000m in altitude. The paths of Andros are of easy to medium difficulty level. However, most of the footpaths include steep parts, so one should bare that in mind. You are most welcome to contact us for further information ! Although there are many hiking routes that start near the major towns, to reach the wider network transportation by bus, rented car or taxi will be required. Andros has not been fully developed as a hiking destination yet. 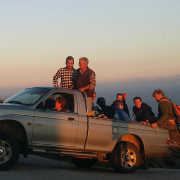 There are no special car parks at start and end points for hikers. The public buses mostly connect the major urban centres of the island, between them and w ith the port of Gavrio. Only a few exist that serve the smaller villages and these are mostly during the summer period. Useful phone numbers for buses and taxis and for renting cars, motorbikes or bicycles are listed here. For the many routes that start from the major urban centres of the island, Chora, Ormos Korthiou, Batsi and Gavrio, you may not need a means of transportation for starting a hike but rather after ending it. No specialised luggage service company exists on Andros for people wishing to organize trekking holidays. If you are a groups of hikers requiring a luggage transfer service please contact us for a special arrangement. The Andros climate is mild, characterised by the prevalence of north winds, a significant percentage of rainfall during the winter months and dry and warm summers with cool winds, the so called ‘meltemia’. A comfortable hike is possible in all months except July and August. In these months with temperatures around 25 to 35 degrees Celsius, and sometimes higher, it can be a little too hot for most people to enjoy a long hike. However in the summer when the moon is full, or close to full, night hikes are possible. Weather Underground Forecast – Two local weather stations on Andros provide data to Weather Underground. The Weather Underground forecasting algorithm mixes this local data with the official weather data to provide a more accurate local forecast. Weather Underground Weather History – Provides historic weather data up to the current hour from weather station ISOUTHAE3 near the port of Gavrio on Andros. 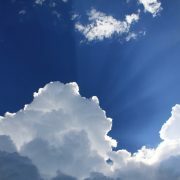 Meteo.gr – A neat and easy to read 5 day forecast. Poseidon.hcmr.gr – Weather information on the Greek Seas. Windguru – A site used by sailors and windsurfers. Provides wind/gust speed and direction. Gavrio Webcam – If you want to see the current weather there is a webcam at the ferry port in Gavrio. Has a link to a time lapse film of the previous 24 hours. Nature & Biodiversity -Andros is the northernmost, second largest, greenest and among the Cycladic islands closest to the Greek capital, with a surface area of 384km2 and a coastline of 148km. It is unigue among the Cycladic islands because of its plentiful water reserves, mountainous terrain, sharp relief and extremely varied scenery. Small forests, fertile valleys, numerous beaches, ravines where water flows all year, gushing waterfalls and springs are to be found in almost every slope and valley. The coastline has more than 70 small and larger beaches. Areas comprising almost half of the island are designated Natura, Important Bird Areas (IBAs) or wildlife sanctuaries, where many rare or endemic species of flora and fauna find refuge. An ancient, man-made landscape- Human presence in Andros has probably been continuous since the 4th century B.C. with numerous settlements developed over the course of time. The human presence has left signs visible even in the remotest and steepest parts of the island, with stone as the raw material in a man-made landscape. The variety of rural architecture is quite astounding: dry stone walls, terraced hillsides (“emasies” in the local dialect), oil mills, threshing floors, more than 200 recorded water mills, 69 windmills, scores of stone bridges some of which are arched and hundreds of rural chapels are scattered everywhere around the island. People & occupations- Agriculture, stock farming, silk production and shipping have been the main occupations of the inhabitants for centuries. About 9000 people (2011 cencus) live on the island today and in their majority are occupied in services, construction, agriculture, live stock farming and fishing. Tourism development on Andros has been rather limited compared to the other islands of the Cyclades. Due to Andros’ proximity to Athens, many vacation homes have been built, whose residents revive the local economy and community during week-ends and holidays. 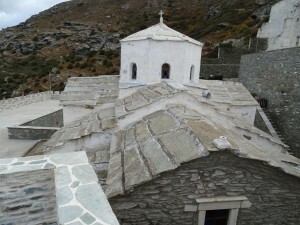 Culture & activities -Andros has many important archaeological sites most of them open and under excavation. Many of their findings are exhibited in the 2 archaeological museums. There is also a maritime Museum, 2 folklore Museums, the Olive Museum, a contemporary digital Museum, an accessible cave, and several historical monasteries and Castles. The Kairis Library holds many important documents from Andros’ history. Numerous cultural events and festivals are organised mostly during the summer period. There is a wide range of activities that are available for visitors. 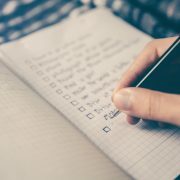 For example, organised hiking routes, bicycle tours, scuba diving, sea tours, sports, cooking lessons and lessons on how to make local products as well as local products tasting events.